Club Penguin Cheats by Mimo777 Club Penguin Cheats by Mimo777: Volcano Construction, Secret Gnome Room AND a Snow Maze... Oh My! Volcano Construction, Secret Gnome Room AND a Snow Maze... Oh My! Let's go find those jackhammers! I am so ready for the Volcano work to be over! A new play at the Stage starts tomorrow! "Norman Swarm Has Been Transformed" will have a huge set. Everyone will look like the size of bugs! This play will also have a secret member only room called The Gnome Room. 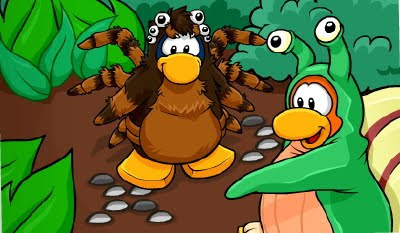 Better go find your bug costumes..soon! 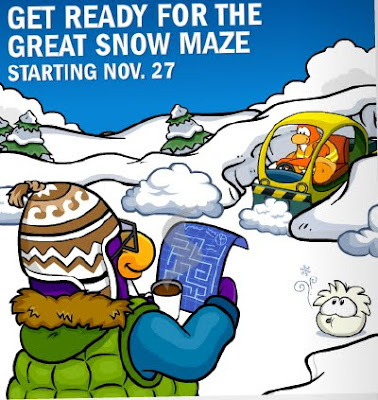 November 27-29th, Club Penguin will have another member only event - The Great Snow Maze! It will be held at the Ski Village and there will be new snow gear and surprises! Let me know what you think about all this cool new stuff. What do ya say about us having a non member party? And, don't forget to check back here tomorrow for all the new play cheats, Volcano updates and new postcards. CLICK HERE TO FIND OUT HOW TO WIN 1,000 COINS! 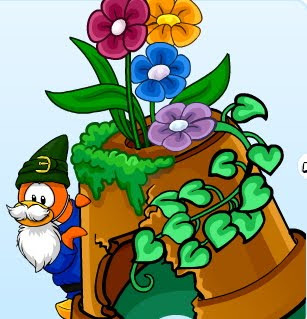 Hey Mimo I think the gnome room will ne only for members cuz,as you already noticed,club penguin is doing a little too much for members! Yep he posted about that on his blog it is going to be members only. if you look closely you can see the amulet on his neck awesome! Mimo, the snow plow in the back of the snow picture is the one from penguin chat 3. It is called the snow plow. 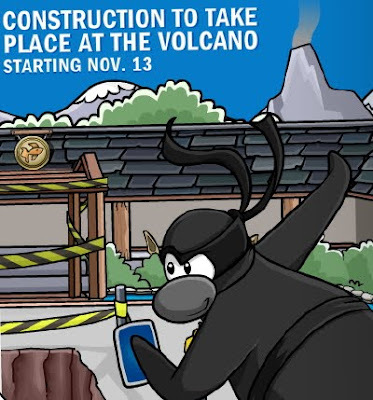 Maybe they are putting in this Club Penguin! I am so glad that us members are getting all kinds of stuff now! I was going to end my membership but now I'm keeping it! I can't wait Mimo! I love the snowtrecker,new plays and postcards. I am a member so I am so happy! That's enough!!! Cp gets really annoying! There are three or more member events in a month!! If you want to make us access CP, only with MEMBERSHIP, DO IT! SAWEET! I'm glad there are no 'Lions and tigers and bears'! (Well, maybe one bear, counting Herbert) This is gonna be the biggest thing since they you invented Zebras Smell Funny! And I think Gnome Room will be members only, too! Mimo's awesome isn't he? Everybody probably loves him! Only on Thurday and Friday, once! MiMo, I think members will be able to see Rory during Winter Festivals... Awesome but.... anyway..
Hmm.. I think that it could be for both members and non-members... will see! Hi Mimo! I'm a really big fan of CP and I wondered is there such a chance for me to be a part of your great gang?? I'd really love that,cuz' I like helping and it will be such a pleasure for me to make things you tell me! Thanks! wow the new SNOWMOBILE and almost everything is for members these days boy am i lucky! Happy birthday for tomorrow lol! all these things are cool except for the member stuff, club penguin gets really unfair some times, and i think they sould equal it out abit and be fair on us nons. this is going to be such a cool new room,play,and snow maze. Sorry, the only members of CPG are Mimo's family. He's tried to come up with a rlly kool way to have CPG Memberships, but he can't think of one! If he does, he'll let us know! Ooh, poor you, dude! I sypathize with u! Happy B-day 2 u, u live in a zoo, u look like a zebra, and u smell like one 2! Zebras smell funny, so you smell funny! Kidding. Happy Birthday!! PLEASE make a non party! But I don't wanna be mean to members... But they get so many other privleges ! I think it's really annoying how they keep making everything only for members! even though i am a member, i wanna come to the nonmember party!btw if any like nonmembers think cp is doing to much for members, beat it! it actually COSTS money to be one. About the non-member party, I just took off my membership(too expensive) and my membership is going off on December 10. Can I go to that non-member party if my penguin is still member? thanks. yea its really a bummer for all the member only stuff but i asked for a 6 month membership for club penguin for christmas and I HOPE THATS WHAT I WILL GET!!! THERE SHOULD SOOOO BE A NON MEMBER ONLY PARTY!!! THAT WOULD BE AWESOME MIMO!!!! i hate this! i was a member but now im not and just now they start all the cool stuff i mean i dont mind not being a member its just they do to much for them now its not fair all club penguin wants is the money from the membership so they make it not fair to non members who maybe cant afford a membership or there isn't any at there Wal-Mart its just not fair! Yeah the jackhammers will probably be a free item. They usually give them out during construction. Sorry loki, only Mimo's family members can be a part of the cpg. finally someone is going to let a non member party! I'm okay with them making some member only stuff, but this is getting a little too much! I know they need to make more money, but can they back off a little bit?